If you are free on Fridays, please join us for the KVBC morning breakfast ride series: Two Wheels Over Easy. We will meet in various locations (probably), ride to a local breakfast haunt (definitely), check out the menu (likely), eat a semi-balanced meal (maybe), then ride some more (guiltlessly). 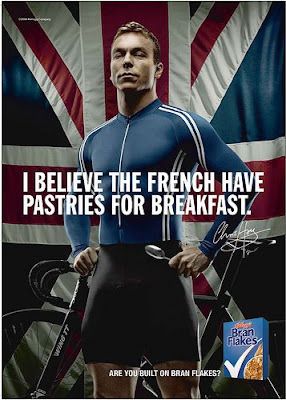 Sounds like fun - even if you're a British velodrome star with a taste for bran flakes. Ah, dedication... (and British humor). "Two Wheels Over Easy" - the KVBC morning breakfast ride series. START: 8:00 AM at the Fayette Community School on Rt.17, about two miles west of the junction of Rt.17 and Rt.41N in Kents Hill. DISTANCE: about 10 miles to breakfast in Livermore, full distance TBD. HIGHLIGHTS: Breakfast! And some great riding, too!